Aortic arch obstruction and bronchial compression are possible postoperative complications in patients with truncus arteriosus communis (TAC) with interrupted aortic arch (IAA). We present a case of bronchial compression as adverse effect of right pulmonary artery (PA) stenting in an infant with TAC (Type 4A)-IAA (Type B) repair. Due to growth potential, self-expandable metal stent was applied for postoperative proximal right PA stenosis, which caused bronchial compression. Later, we found patient having bronchomalacia. Surgical removal was needed. Stent insertion might be an option for postoperative PA stenosis, but bronchial compression might be a potential risk, particularly in patients with bronchomalacia. Truncus arteriosus communis (TAC) is a rare congenital heart defect. One arch abnormality of considerable importance consists of a large ductus arteriosus associated with severe hypoplasia or interruption of the distal aortic arch (IAA). This occurs in about 10%–15% of cases and has been considered as a risk factor for surgical mortality. It is possible to have bronchial compression as complication after the surgery with direct aortic arch anastomosis. The patient developed the right pulmonary artery (PA) stenosis that was treated by self-expandable PA stenting at 2 months after surgical repair which then caused bronchial obstruction. We performed surgical removal of the stent and PA reconstruction at 7 months of life. Investigations were in accordance with the Ethical Standards of the Helsinki Declaration of 1964 and all subsequent revisions. A 6-day-old twin male infant weighing 2760 g was born in our institution at gestational age 38 weeks. Echocardiography allowed the diagnosis of TAC 4A, with interrupted aortic arch (IAA) and trivial truncal valve regurgitation. The truncal valve appeared to be more than 75% committed to the right ventricular side of the ventricular septal defect (VSD). It was IAA Type B [Figure 1]. Surgical correction was performed on day 6 through a median sternotomy. Myocardial protection was achieved with antegrade cold blood cardioplegia at a core temperature of 28°C. Right ventriculotomy was carried out, and VSD was closed with Dacron patch to reroute blood flow from left ventricle to truncal valve. Both right and left PAs separately originated from the posterior side of the main PA and were excised en bloc, and this area was patched with homograft. The ductal tissue was carefully removed, and the subclavian artery and the descending aorta were sewn to the homograft augmented main PA trunk rather than the relatively small ascending aorta to avoid potential bronchial obstruction. Twelve millimeters pulmonic homograft was used as RV-PA conduit. The postoperative course was uneventful. The postoperative echocardiography revealed no pressure gradient at the homograft site. Follow-up echo revealed progressive worsening of pressure gradient across the proximal right PA (peak PG 70 mmHg). He underwent self-expandable stent insertion at the proximal side of the right PA at 2 months after surgery, but this caused progressive narrowing of the left main bronchus. Therefore at 7 months of life, he underwent stent removal and PA repair under cardiopulmonary bypass. The patient's postoperative course was complicated with bronchomalacia, which required prolonged intubation. The patient was discharged from the hospital after 54-day hospital stay. Most recent follow-up echocardiography at 36 months of life showed almost no right PA stenosis, mild truncal valve regurgitation, and mild homograft regurgitation and excellent cardiac function. TAC with IAA is a very rare cardiac anomaly. The previous study about patients with TAC-IAA showed 12.5% early deaths among 16 patients after surgery. More recent report showed no mortality among 9 such patients. 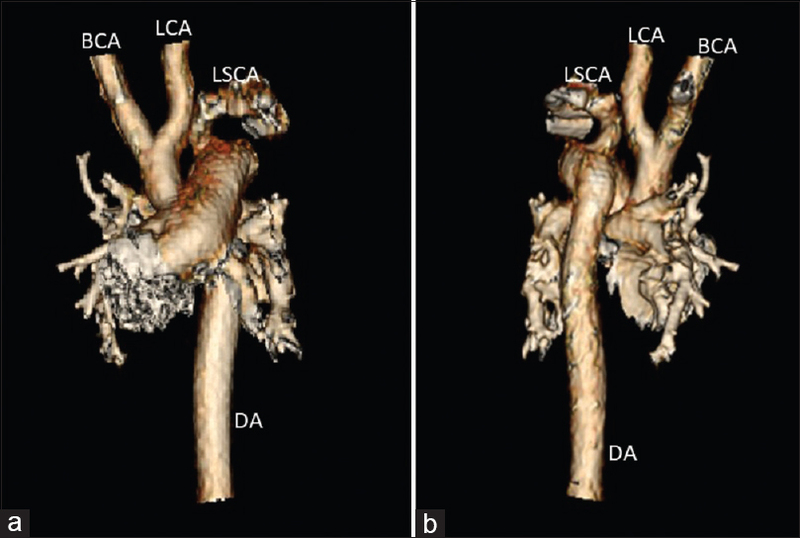 A number of issues need to be addressed during the repair of TAC-IAA such as aortic arch repair, right ventricular outflow tract reconstruction, and often truncal valve repair. Despite good early results, recurrent arch obstructions still develop in some patients during follow-up. The aortic arch reoperation rate in the congenital heart surgery study was 13.2% (5 of 38), with the arch in most of the patients being initially repaired by direct anastomosis. Another possible major complication from the direct end-to-side aortic arch anastomosis is bronchial compression. TAC-IAA has large main PA truncal segment. If the area, where the both pulmonary arteries were excised, were patched, then this main PA segment becomes a good conduit reaching to the descending aorta. Based on this idea, we used patch augmentation technique rather than direct anastomosis to the ascending aorta to avoid possible bronchial compression. This worked well; however, the patient developed proximal PA stenosis, which was away from the suturing line and required a balloon dilatation without success, followed by stenting. We believed that stent insertion might relief his symptom and self-expandable stent (5 mm × 20 mm) could be a possible better solution because it has high radial force and tends to take the shape of the vessel. It has also been reported to have lower incidence of edge tears, which is related to less thromboembolic events. Follow-up intravascular ultrasound analysis showed that the minimum stent area of the self-expandable stent increased by 33% at 6 months, whereas no change occurred in the balloon expandable stents, This was accompanied by a greater degree of intimal proliferation in the SE stents compared with BE stents. Strut malapposition can be another potential drawback, particularly if it happens in small vessels and small babies. In adult patient with acute ST-segment elevation myocardial infraction, strut malapposition at 3 days is significantly lower in SE stents than in BE stents. Based on these evidences, we chose SE stent in our patient. However, these benefits created a problem in this infant with bronchomalacia. We are not sure if it would not have occured with balloon expandable stent. He developed bronchial compression due to the stent with progressive worsening [Figure 2]. He eventually underwent surgical removal of the stent and PA repair. Postoperatively, we found this patient had bronchomalacia, which required prolonged mechanical ventilation. Bronchial stent might be a solution instead of surgery, but in a circumstance of proximal PA stenosis, surgical treatment would be the choice, particularly if we know the patient has bronchomalacia. Based on our experience, PA obstruction should be carefully evaluated. Stent insertion may have priority, particularly in a patient with proximal PA stenosis, but surgical repair may be the better choice in a young infant with congenital heart defect. Van Praagh R. Truncus arteriosus: What is it and how should it be classified? Eur J Cardiothorac Surg 1987;1:65-70. Tláskal T, Hucín B, Kostelka M, Skovránek J. Successful reoperation for severe left bronchus compression after repair of persistent truncus arteriosus with interrupted aortic arch. Eur J Cardiothorac Surg 1998;13:306-9. Bohuta L, Hussein A, Fricke TA, d'Udekem Y, Bennett M, Brizard C, et al. Surgical repair of trucncus arteriosus associated with interrupted aortic arch: Long-term outcomes. Ann Thorac Surg 2011;91:1473-8. Jahangiri M, Zurrakowski D, Mayer JE, del Nido PJ, Jonas RA. Repair of the truncal valve and associated interrupted arch I neonates with truncus arteriosus. J Thorac Cardiovasc Surg 2000;119:508-14. Konstantinov IE, Karamlou T, Blackstone EH, Mosca RS, Lofland GK, Caldarone CA, et al. Truncus arteriosus associated with interrupted aortic arch in 50 neonates: A congenital heart surgeon society study. Ann Thorac Surg 2006;81:214-22. Han RO, Schwartz RS, Kobayashi Y, Wilson SH, Mann JT, Sketch MH, et al. Comparison of self-expanding and balloon-expandable stents for the reduction of restenosis. Am J Cardiol 2001;88:253-9.
van Geuns RJ, Tamburino C, Fajadet J, Vrolix M, Witzenbichler B, Eeckhout E, et al. Self-Expanding Versus balloon-expandable stents in acute myocardial infarction: results from the APPOSITION II study self-expanding stents in ST-segment elevation myocardial infarction J Am Coll Cardiol: Cardiovasc Interv 2012; 5:1209-19. Grohmann J, Stiller B, Neumann E, Jakob A, Fleck T, Pache G, et al. Bronchial compression following pulmonary artery stenting in single ventricle lesions: how to prevent, and how to decompress. Clin Res Cardiol 2016; 105:323-31.